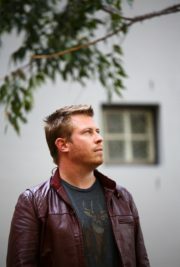 Michael R. Griffiths is a Lecturer in the English and Writing Discipline at the University of Wollongong. He received his PhD in English from Rice University in 2012 and was INTERACT Postdoctoral Fellow at the Institute for Comparative Literature and Society at Columbia University from 2012 to 2014. As an academic, he has published on topics ranging from settler colonial biopolitics to indigenous life writing to the critical theory of decolonizing poetics, and much besides. He is writing a scholarly book, tentatively entitled The Distribution of Settlement: Indigeneity, Recognition and the Politics of Visibility (under contract, UWAP). His poetry has previously been published in Paper Nautilus. they’re coming to take me away. it is a reckoning of remainders. the earth reminds us of what is stripped away. to the depths where the dhufish live.